On February 2, the United States government expanded its list of sanctions against Venezuelan officials, accusing them of having violated human rights, during violent street protests, in Caracas last year, which purportedly were backed by jailed anti-government opposition leader, Leopoldo López, among others. Due to the severity of these sanctions, relations between the United States and Venezuela have deteriorated further to a new level of hostility.1 However, at the same time, China has been generously co-signing financial transactions with the Venezuelan government including the borrowing of billions of dollars in exchange for future trade advantages. Since 2007, China has loaned Venezuela a total of $48 billion USD. But China’s help does not stop there. China’s generosity has reinforced the movement towards Latin America integration, fortified regional promotion of a multi-polar world, and it also has diminished somewhat the economic leverage of the United States in the region. In January 2015, after a trip to Beijing and a meeting with Chinese President Xi Jinping, Venezuelan President Nicolas Maduro announced that Venezuela will receive $20 billion USD in Chinese investments. 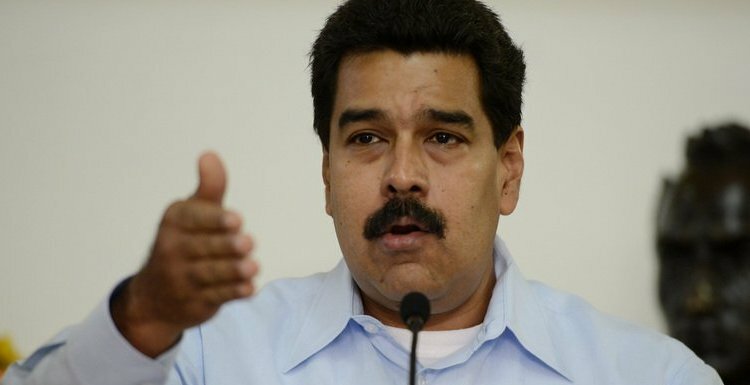 Maduro also announced that this investment will be used on housing, technology, energy, and infrastructure projects. However the President did not provide further details on whether or not Venezuela will use this investment to import goods or pay old debts.2 Beijing’s financial help has been arousing controversies in the United States and the European Union, since Venezuela has been routinely accused of wanton human rights violations by corporation-funded but heavily biased western media. Both China and Venezuela have been benefitting from the close economic ties that had been forged starting in 2001. Although China and Venezuela began their diplomatic relationship in 1974, it was not until 2001, after China joined the World Trade Organization (WTO), that the two nations established a strategic, economic partnership. Since 2007, Venezuela has been able to secure nearly $50 billion USD, in loans, from the China Development Bank Corp (CDB).6 To be specific, from 2007 to 2012, China made four loans of $4 billion USD to Venezuela for energy infrastructure. In April 2010, there was another $10 billion USD loan package that went to the state oil company, PDVSA. Later in 2010 and 2011, Venezuela received two $4 billion loan packages again.7 These investments were not simply a charitable offering in order to facilitate Venezuela’s economic development; they also benefited Chinese corporations. Although the loans were made at a low interest rate, the Chinese had conditions on how Venezuela should assign them. In fact, the use of these loans have led to a relatively stronger Chinese commercial presence in Latin America, while Venezuela was able to develop its own financial institutions, in a win-win situation. One characteristic of financial cooperation between China and Venezuela is that the Chinese provide technology and equipment while the Venezuelans export natural resources to China. In 2010, Wuhan Iron & Steel Group, the third biggest steel maker in China, signed a contract to import iron ore from a Venezuelan company.9 The two countries later furthered their cooperative ventures, in 2014, when SANY Heavy Industry invested in the building of eight construction material factories in Venezuela. The Minister of Public Works and Housing of Venezuela, Ricardo Molina, said “these factories will be able to provide enough construction material for 200,000 units of housing.”10 However, one needs to recognize that this cooperation is based on the abundance of Venezuela’s oil reserve and its auspicious mining locations. While the Chinese may have near endless supply of cash due to its large economy, Venezuela does not have bottom-less oil fields or extractive resources. Therefore, it is important for Venezuela to diversify its economy, as well as encourage technological innovation. In addition to the supply of technology and infrastructure, China also brings in human resources. As the Venezuelan government gives contracts to large Chinese firms, these enterprises have begun to hire more Chinese workers in Venezuela. For example, in 2012, Huawei, a major telecommunication company in China, had over 1000 workers in Venezuela, and four hundred were Chinese nationals.11 According to the New York Times, there are more than 50,000 Chinese who are settled across Venezuela today.12A considerable portion of this impressive number are Chinese people who have come to Venezuela to work as shopkeepers. This trend of immigrant workers suggests that Chinese investment not only has a direct effect on Venezuela, by helping with its economic development and its finances, but it has also brought on more frequent exchanges of various kinds between the people of both countries. Although Chinese companies and funds opened up the job market, many local workers also complain that a large number of job opportunities in Venezula have been taken by Chinese workers. Also, China backed companies in Venezuela are often accused of abusing local workers for having them work long hours.13 In 2011, Venezuela had 77 construction projects under contract with China, which employed over 2,800 workers then stationed in Venezuela. One of these projects based in Barinas had 812 workers, about 43 percent of which were Chinese citizens.14 Cooperation with China usually comes with a price, but as Venezuela continues to face economic turmoil, Chinese funds are becoming more and more crucial to the country’s economic planning. While China offers loans without threatening to interfere with a country’s internal and foreign policies, funding from the United States often involves conditions in which less developed countries are asked to follow the United State’s neoliberal model for their development. Nonetheless, this does not mean that the Chinese loans come with no conditions attached. As in any other trading relation, the Chinese ask for guarantees in return for their generous loans. In the case of Venezuela, the Chinese are aiming for Venezuela’s rich oil reserves. Although the United States has remained the largest importer of Venezuelan crude oil, compared to a decade ago when oil shipments from Venezuela to the United States has dropped 49 percent.15 When Chinese President Xi visited Venezuela in mid-2014, he signed a $4 billion USD oil-for-financing deal with Venezuela.16As a late-comer into the energy trade, China has taken advantage of Venezuela’s urgent demand for funds in exchange for a secure and politically protected energy source in the future. 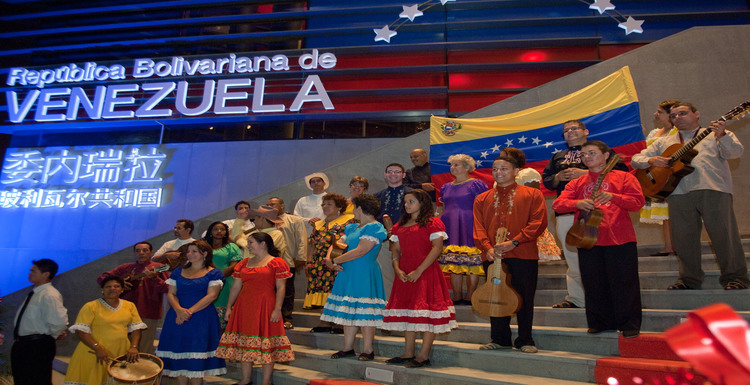 Chinese-Venezuelan relations have also brought about important cultural and educational exchanges between the two countries. These exchanges in fact, began long before the close economic partnership initiated in 2001. Since 1961 China has been accepting students from Venezuela, and as of 2012, 127 Venezuelan students have studied in China with a scholarship funded by Venezuela. Furthermore, starting from 2015, China will be offering 100 Venezuelan student scholarships to study in China annually.17 As the number of Chinese workers in Venezuela increases, so too does the desire for sharing Chinese culture. Trying to address the Chinese workers’ needs, seen as a feature of human development, PDVSA organized a Chinese Spring Festival in 2012.18 The venue was decorated and the Chinese ambassador to Venezuela, Zhao Rongxian, expressed his gratitude, as well as the Chinese government’s positive expectation on further cooperation in this sphere. Although the Chinese Ministry of Foreign Affairs has avoided discussing which issues China and Venezuela share similar views on, in both of their statements China and Venezuela were admittedly heavily influenced by the U.S. economy. The United States gradually emerged as a world super power after the WWII, and it has since been trying to use its large economy to dominate the development of other regions. Nevertheless, in Latin America, in the 2000s, foreign investment and international power have been slowly shifting away from western countries, and specifically from the United States, to China. Pacific Asia and Latin America have taken advantage of their natural and human resources to develop their own economies. In particular, China and Venezuela have built bridges based on a mutual respect for the other’s sovereignty through educational and cultural exchanges. In December 2014, Obama decided to reset U.S. relations with Cuba and ease the embargo and at the same time, escalated heavy-handed strategies against Caracas. Obama acknowledged the embargo against Cuba as being obsolete and ill-advised. In comparison, Venezuela remains under the influence of a U.S. two-sided foreign policy. Not only is the United States unwilling to ease sanctions and condemnation on Venezuela, but it has gone further to impose more anti-Caracas bans in the name of human rights. The United States has been using human rights as an excuse to intervene in the internal affairs of Latin American countries for decades. If the claims about ideological differences were important and true, why is Venezuela being singled out? The United States is only using such excuses to maintain its sense of dominance against selected foes. Latin America has long lived under the shadow of the United States. On the other hand, China is willing to offer its financial and economic cooperation to Latin America in an exchange for much-needed resources. The technological, infrastructural and constructional support China provides Venezuela has become a pathway for it to pull away from the United States. The bans on Venezuelan officials’ visas are solid evidence that the United States does not fully appreciate the nature of the Venezuelan-Chinese strategic partnership because such measures only push CELAC (Community of Latin American and Caribbean States) towards more integration with the BRICS economies. China’s vast investments and loans in the entire Latin America theater will greatly reduce U.S. influence in the region. Since the beginning of the new century, China has been working closely with CELAC, an organization of American countries that excludes the United States and Canada. Latin America has since intensely traded and invested in the Chinese market, currently one of the most profitable markets in the world. The region has also become less dependent on the U.S. market which comes with U.S. intervention when it comes to domestic affairs. The sharp increase in trade between China and the region suggests that the geopolitical circumstance existing in Latin America is rapidly changing. The United States trading market is no longer the most important market for Latin American products; because of the growing relationship of the CELAC countries and China now have, one can readily expect enhanced trade and investments between China and CELAC will quickly grow in range and diversity. As an important player in Latin America, Venezuela inevitably has become one of China’s primary focuses in the CELAC countries. Venezuela accounts for a large portion of China’s investments in the region. The United States has been trying to slow down the development through the hemisphere using the practice of sanctions to punish Caracas ostensibly on human rights ground, but more realistically has been inspired by a geopolitical orientation. However, as China joins the battle against U.S. preeminence, it is becoming clear to U.S., policy makers that the world is moving toward a multi-polar system. More importantly, rather than slamming sanctions filled with contradictory excuses such as human rights violations, China respects Venezuela and other countries’ sovereignty and stability. Venezuela is now using China’s strong support to develop a stronger economies as well as leading the way toward continental integration in the multi-polar world system. Venezuela has brought in billions of Chinese funds, and has cooperated with China in various investments and trade areas, such as agriculture, construction, telecommunication, tourism and mining. According to Ivan Antonio Guerrero Zerpa, Venezuelan Ambassador to China, in the next 10 years, Venezuela’s strategic plan will include bilateral cooperation on creating Special Development Zones and Special Economic Zones in the country. Moreover, the ambassador also mentions that Venezuela recognizes the increasing need of natural resources in Asian countries, and he believes this could be an incredible opportunity for the two regions to increase their trade.22 With an established demand and supply chain between Venezuela and China, it is fair to predict that while the United States continues to apply more sanctions on Venezuela, China will be there to support Venezuela’s development requirements. At the same time, China will be able to rely on Venezuela, one of the most oil-rich countries in the world, to be its natural resources exporter as well as the importer of technological products. Now that Venezuela and other CELAC countries can count on another main economic partner waiting to fill the void, the grip of the United States on the region is softening to a marked degree. “China agrees to invest $20bn in Venezuela to help offset effects of oil price slump”, The Guardian. Published January 8, 2015. http://www.theguardian.com/world/2015/jan/08/china-venezuela-20bn-loans-financing-nicolas-maduro-beijing. Even Ellis, China on the Ground in Latin America: Challenges for the Chinese and Impacts on the Region (n.p. : Palgrave Macmillan 2014). Guerrero Zerpa, Ivan Antonio. “China And Venezuela, A True Model And Example Of Mutual Respect.”China Today63, No. 8 (August 2014): 46-47. ← More Pragmatic, Less Ideological: Bringing the U.S. and Bolivia Together?